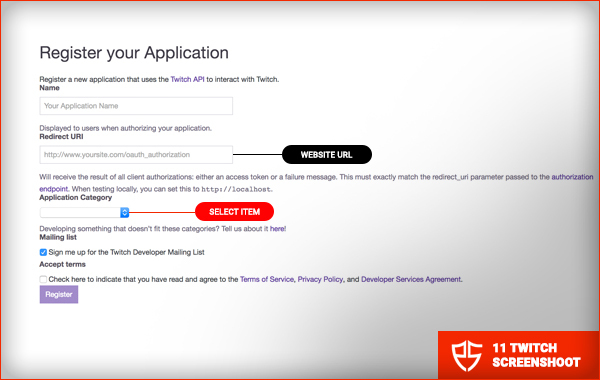 In the field on the right you need to fill it up with your Twitch Profiles Client ID. Once you’re on that page you need to scroll down to the bottom of the page and find ‘Other Connections’ here you will get that client ID from. Check the box where you agree with their Terms of Service/Use policy. If you have filled up the fields above correctly, the page should reload with a new field in it - CLIENT ID, just copy paste the code back ( it will the long form of characters that actually don’t make sense ) to the Admin Panel - PixiePanel - Streams - Twitch Integration - Client ID field. Finally click save and you’re DONE!